- Verse 2 is locked to Hard difficulty. At this point the game likes to throw heaps of enemies at you, so they tend to dogpile you. The first stage, for example, has 23 enemies total, which can cause massive lag on the PS3. Fortunately you can mash dodge and probably get Witch Time. - The first stage of each verse is always filled with weaker enemies, giving you the chance to heal up after a Jeanne fight. - You may notice I make use of the Kilgore switch a lot. Technically with just regular handguns equipped it doesn't do the crazy amount of damage like the actual glitch (as long as you have any durga equipped on the feet and kilgore on your other weapon set you can do the glitch), but it's still a useful move for high damage and getting high combo points quickly. - This verse is the only time you'll see Inspired in Angel Slayer. Something which I didn't mention in the main playthrough is that a wicked weave will always bring them down. 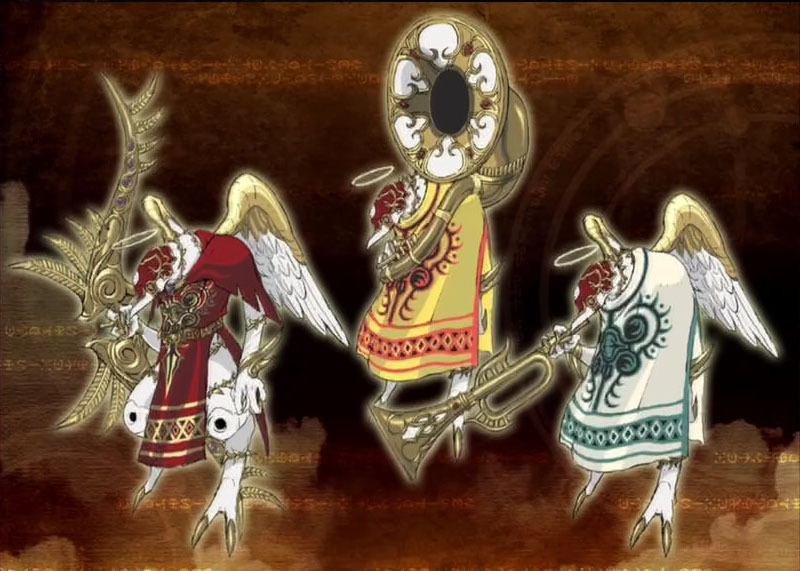 - The tuba Affinity (Affinity C) have an area attack with their laser-equipped tuba. That attack actually damages other enemies, and can really mess up your combo rank in regular gameplay, so it's best to kill them first. - Gigantic Beloved like to hog the camera, making it a pain whenever they show up. Best way to kill them quickly is with a punch attack with their angel arm (the axe/hammer). - So, the boss fight for this verse is two Jeanne 2. Surprisingly, I don't have too much trouble keeping track of two Jeannes, although I swear I would dodge their wicked weaves properly and the game wouldn't give me witch time (which happens a couple of times this verse) You can use angel arms on them (like the claws I picked up), but you will need to take advantage of a certain property of most enemies in the game, as two Jeannes on Hard difficulty are very agressive. Most enemies, when not visible on-screen, will become much more passive. If they do attack you from off-screen, there are audio cues. In the case of Jeanne, she will either shoot at you, which comes with an audio cue to alert you, or she will simply walk closer to you. This property can be abused throughout the entirety of Angel Slayer, something which I'll talk about as we get there.